Power BI also supports national clouds. 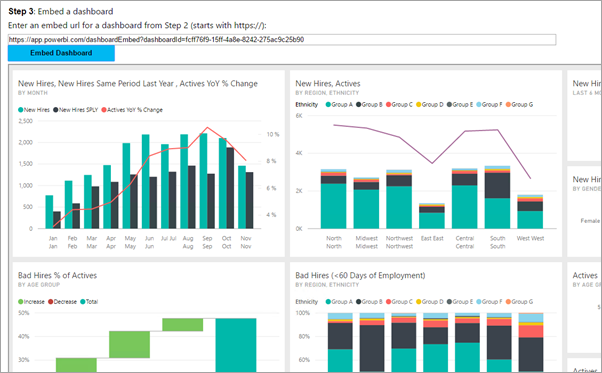 To get started with this walkthrough, you need a Power BI account. If you don't have an account set up, then depending on the type of government or country you can choose the right national cloud for you. You can sign up for a U. S. government Power BI account, a Power BI for Germany cloud account or a Power BI for China cloud account. Looking to embed a dashboard for your organization instead? See, Integrate a dashboard into an app for your organization. This article shows the code used in the App Owns Data sample on GitHub. To follow along with this walkthrough, you can download the sample. GCC accounts only support P and EM capacities. Overwrite Cloud.config file with GCCCloud.config content. Update applicationId (Native app applicationId), workspaceId, the user (your master user), and password in Web.config file. Add the GCC parameters in the web.config file as follows. Overwrite Cloud.config file with TBCloud.config content. Add the DoDCON parameters in the web.config file as follows. Overwrite Cloud.config file with PFCloud.config content. Overwrite Cloud.config file with Power BI for Germany cloud content. Add the Power BI for Germany cloud parameters in the web.config file as follows. Overwrite Cloud.config file with Power BI for China cloud content. Add the Power BI for China cloud parameters in the web.config file as follows. Register your application with Azure AD to make REST API calls. For more information, see Register an Azure AD app to embed Power BI content. Since there are different national cloud affiliations, there are distinct URLs to register your application. If you downloaded the Embedding for your customer sample, you would use the applicationId you get, so that the sample can authenticate to Azure AD. To configure the sample, change the applicationId in the web.config file. Within your application, you need to get an access token, from Azure AD, before you can make calls to the Power BI REST API. For more information, see Authenticate users and get an Azure AD access token for your Power BI app. Since there are different national cloud affiliations, there are distinct URLs to get an access token for your application. You can see examples of these access tokens within each content item task in the Controllers\HomeController.cs file. To embed your Power BI content, you need to do a couple of things to make sure it embeds correctly. While all of these steps can be done with the REST API directly, the sample application and the examples here use the .NET SDK. With your access token, you want to create your Power BI client object, which allows you to interact with the Power BI APIs. You create your Power BI client object by wrapping the AccessToken with a Microsoft.Rest.TokenCredentials object. // Create a Power BI Client object. This is used to call the Power BI APIs. Use the Power BI client object to retrieve a reference to the item you want to embed. You can embed dashboards, tiles, or reports. Here is an example of how to retrieve the first dashboard, tile, or report from a given workspace. A sample is available within Controllers\HomeController.cs of the App Owns Data sample. // To retrieve the tile, you first need to retrieve the dashboard. // Get the first tile in the group. Because embed tokens are intended for developer testing only, the number of embed tokens a Power BI master account can generate is limited. A capacity must be purchased for production embedding scenarios. There is no limit to embed token generation when a capacity is purchased. A sample is available within Controllers\HomeController.cs of the Embedding for your organization sample. A class is created for EmbedConfig and TileEmbedConfig. A sample is available within Models\EmbedConfig.cs and Models\TileEmbedConfig.cs. // Generate Embed Token for a tile. An application sample is available within the Embedding for your organization sample. // Embed configuration used to describe the what and how to embed. // Embed the dashboard and display it within the div container. // Embed the tile and display it within the div container. A sample application is available on GitHub for you to review. The above examples are based on that sample. For more information, see Embedding for your organization sample.